Your bump is so cute! I think you should post pregnancy posts whenever you want. If people don’t want to read it (for whatever reason) then they don’t have to. My opinion is if it’s your blog then you should post what you want. And I’m going with a girl! Aww, thank you so much Maureen! That means a lot to me!! I will write down that your vote it girl! The vast majority of people guessing have been saying girl, so I am so curious to see if everyone is right! Also, you are adorable with your baby bump! 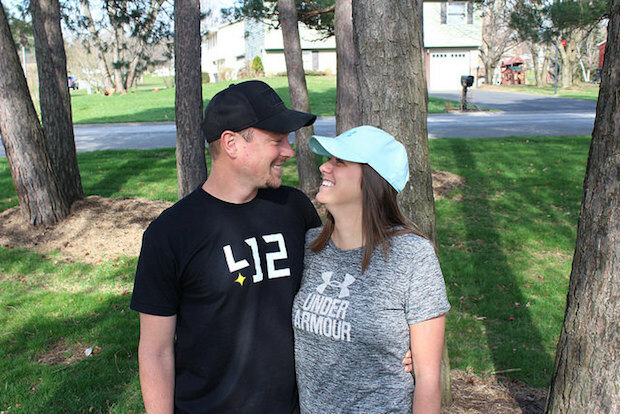 I love that you are sharing your pregnancy journey with us. I would personally love to see all the pictures and hear about your journey. I agree with Maureen: it’s your blog, so if people don’t want to read it, they can just move along. Very exciting!! Thank you for the compliment on my bump and the advice on sharing about the pregnancy! I really appreciate it!! Hooray for a bump pic! You are all baby right now girl. I think it’s a cute pic, and you should share what you’re comfortable with. I’d love to read some about your journey but I also like how you blog about other things too and how your blog hasn’t become ALL pregnancy. Also your laundry room is super clean and cute too (def. looks better than my house). Farm fresh eggs are the best. You can tell a difference, especially when the egg yolks are really dark. They just taste better- I can even tell when restaurants serve them. Gonna go watch the vlog now. Aww, so glad you liked seeing a bump picture!! I so appreciate your input on sharing what I’m comfortable with! Thank you!! 2. I think it’s very neat that you do marketing and social media for your family’s business! I was just telling Nate the other day that I love that sort of thing… I originally went to college for that actually (marketing), but then I changed it to English / journalism. Writing is my passion, but I definitely do have a love for photography and design. 🙂 It must be so much fun to work with your family like that! 3. You know that I love my coffee… 😉 I used to be Starbucks all the way, but I just can’t afford it as much these days. Ha, ha. So I’m a Dunkies girl now! I usually order iced with just cream… BUT if I’m splurging, then I’ll do a shot of caramel or mocha. I also like raspberry coffee with a shot of mocha. YUM! 4. Your bump is SO cute!!!! And I agree with everyone else… This is your blog, and you should be able to blog about your crazy, exciting experience of being pregnant. 🙂 I know your concerns about hurting others. I felt the same way at first, especially after my miscarriage. But here is the thing, once you become a mom, you will be engulfed with ALL things baby, as you should. 🙂 Your life is going to now revolve around this beautiful, precious life. You are moving from a family of two to a family of three. And pregnancy is your journey to get there. So even if you don’t blog about it now, you’ll find it impossible not to write about mom life once baby arrives. 😉 Trust me on that one. HA! So I think you should feel completely free to share whatever you want to regarding that. It is SUCH an exciting time!!! And even though this baby hasn’t been born yet, he or she is already loved. He or she is already a creation of God’s. That little baby is already a part of your family in its own way, even if it is safely snuggled in your belly right now. I know exactly what you mean about farm fresh eggs vs. store eggs… like what is going on that they are so vastly different?! I had no idea you started out in marketing and switched over to English/journalism. You obviously have a knack for writing, but I can totally see you getting into design and that type of marketing! 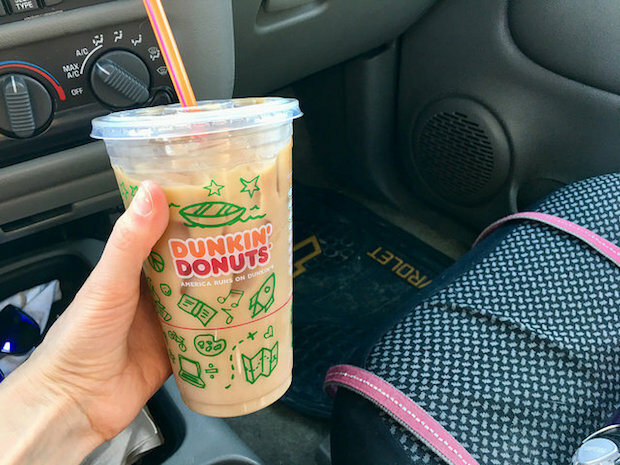 I’m not much of a coffee drinker and I’ve never tried Dunkin’ coffee. I should surprise Kevin with an iced coffee from there sometime – he’s a Starbucks guy through and through so he can compare and maybe find a new favorite outside of Starbucks. Oh my goodness I love that baby bump photo. You look gorgeous. How exciting that you felt the baby move and Jimmy did too! That is such a special part of pregnancy. 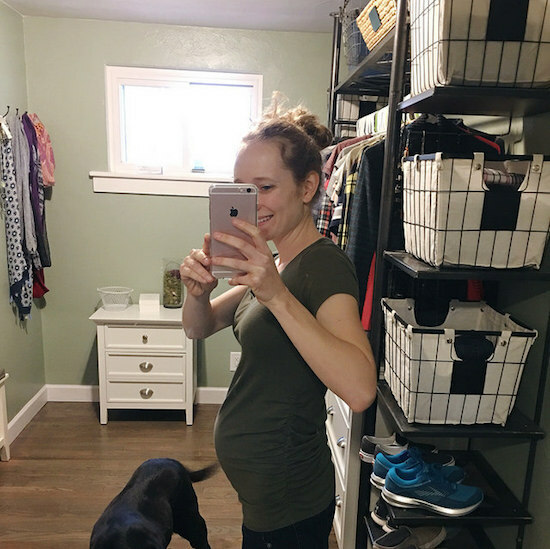 I love reading about pregnancy so I hope that you share your experiences on the blog. I agree with everyone above – if a reader isn’t interested in those posts, they can skip them. Oh and my guess is girl! I have a feeling Kevin would love that surprise! Even if he didn’t like the coffee from DD, at least it would be a sweet gesture! I do love a good Sbux latte! Those just can’t be beat. Thank you for the compliment on the bump photo!! It was so, so cool to feel the baby move, and now that I know what to expect in terms of that feeling, it’s the best to know baby is just wiggling around in there having a ball! I will definitely be sharing more! The shading of those egg shells—so pretty! And I have never heard of a blueberry latte! If you ever go to a Dunkin, I’d recommend it if you’re into fruity drinks!! Yay! Thanks, Josiah!! I will write down your guess! Jimmy is excited you’re on team boy with him 🙂 Can’t wait for you to meet your new cousin! Also, your vlog was so fun to watch! I don’t think many people include vlogs on their blog and so it was definitely fun to see another dimension into your life. You and Jimmy are just the cutest together; it’s absolutely evident how much you enjoy each other’s company. ❤ On another note, your house is the cutest! 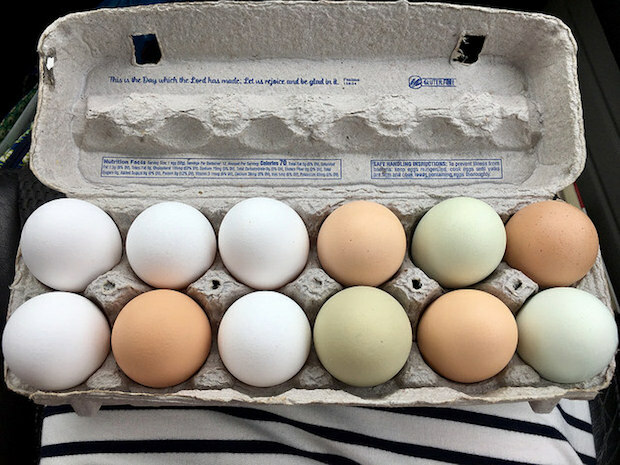 Farm fresh eggs are so good! Glad you get to enjoy them from time to time. And yay for being able to drink coffee again. I love your vlogs so I’m glad you do these. 🙂 Look at Lola and Mavis snuggling together. So precious! Yay for feeling Baby move!! I love that! It’s such a precious feeling! Aww, yay!! Thank you so much, Rach! I have you and Christopher marked down as girl for your guesses!! So exciting! Omg baby bump! So adorable! Thank you for the encouragement, Mackenzie! That means so much to me! I hope you get to try farm fresh eggs. They are divine!